From all of us at FDF (well its just me) I/we wish you a Happy and Safe New Year. All the best on 2009. We will return next Friday (January 9th) with a new entry. What caused me to blow off the dust? - It is Christmas time, plus last year we looked at Volume One and it was a pretty big hit with readers. Overview - A second collection of tunes from the claymation, stop motion Christmas specials that always seemed to air the day after Thanksgiving. Now with DVD copies of said specials, you never can be too far out of reach of one. FDF Comments (aka the songs) - broken down by Song and the special it came from. The collection opens up with the one/two punch of "Heat Miser" and "Snow Miser" both from "Year Without a Santa Claus". Both tracks you'd expect to appear on a Volume one, but they must have done this on purpose. Unload the big guns right at the outset. "We Wish You A Hairy Chestwig" is culled from "The Ren & Stimpy Show Crock O' Christmas". The cartoon cat and dog combo offer up some laughs, more on the spoken word portions leading up the song (sung to the tune of We Wish You A Merry Christmas). Going back to the formula of the first two songs we get a "double shot" from the special "Santa Claus is Coming to Town" when The First Toymaker to the King and "No More Toymakers To the King". The musical formula is identical (good time saver) just change the lyrics some. A classic Burl Ives lead "Silver and Gold" from "Rudolph The Red-Nosed Reindeer" may sound a little unfamiliar, but you are quickly calmed when his smooth voice hits your hears. 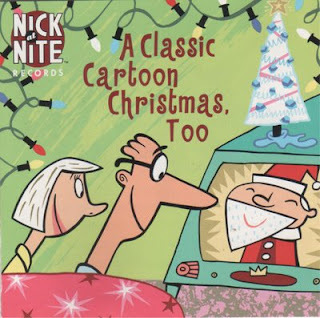 A sort of odd sounding "There's Always Tomorrow" from "Rudolph The Red-Nosed Reindeer" is included. Sung by a solo female voice (not credited in full on the compilation) doesn't really feel "Christmasy" and you sort of start to wonder if the producers struggled to put the finishing touches on the compilation. Its not a bad song, but seems a smidge out of place. The track "Holidays" comes from "Madeline's Favorite Songs". It is sung by some young sounding people with french accents. A track I had personally never heard before this collection is "Follow that Star" from The Beginner's Bible Sings". It is a very Christian rock song. Its not horrible, but it is just not my bag at all. The collection wraps up with "The Lord's Blessing" that comes from the darkhorse holiday special "Mr. Magoo's Christmas Carol". Knowing the story of a down trodden family at Christmas time comes to life with a happy uptempo song about a family realizing they have the true meaning of the holidays, and that just being together is a gift enough. FDF Overall Take - A pretty strong Christmas collection. Someone will have the smarts to put this (and volume one) out once more. These songs, although campy, usually where most people find their favorite versions. Produced By - The collection is listed as being produced by "Rock River Communications"
Release Date - August 2003. Overview - I have no idea how this cd landed in our collection. I can't tell you when the last time we shopped at a Pottery Barn. I am sure it was free gift, or very inexpensive honestly, I really have no idea. The cool part is there are some decent versions of the old standards here. FDF Comments (aka the songs) - "Merry Christmas Baby" is done by Otis Redding, and many have heard the Bruce Springsteen version from "A Very Special Christmas" so you sort are used to this version. Redding is fine voice, as always for this nice change of pace. "Christmas Everyday " by Smokey Robinson & the Miracles has a great saxophone section after the verse keeping it with a nice do-wop feel. "Santa Claus is Coming to Town" performed by the Jackson 5 is really a great version. The song is uptempo to begin with by Micheal hits the like "Santa" with that high falsetto of his young voice. The brothers Jackson remain a solid backing band and offer great harmonies. 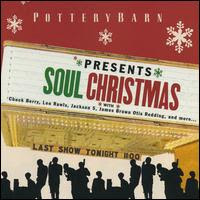 Keeping with the well know, strong soulful artists is "Soulful Christmas" by James Brown. I think if every Christmas song was like I might like Christmas music better. Check it out in the download section, you'll be shouting "MACEO" just like James did. "Everyday Will Be Like A Holiday" performed by William Bell is next. Its a much mellower song compared to the last two, but is a pretty melody and when you focus on the vocals it really sicks out and hits you. We pick up the pace once more with Chuck Berry's take on "Run Rudolph Run". This song you hear pretty often, so there is not a lot one can add to this. Koko Taylor does a very blues based version of "Merry, Merry Christmas", you can almost smell the smoke and whisky on her voice. Another very pretty song is in "Please Come Home For Christmas" performed by Charles Brown. The version on the cd sounds like it was mastered poorly though, and it may be a mono recording moved to stereo. Its a pretty great song, but it does not sound as good as the other tracks. Canned Heat run thru the aptly titled "Christmas Blues" with its 12 bar blues bass line, and flashy guitar fills over a simple drum, cymbal run. A Christmas song you can dance to? Look no further than "Good Time Christmas" by Lou Rawls. A gruff, soulful take with splashed of baritone sax adds a great twist to the song. The cd is packed with stellar vocalists (and musicians mind you) and we hardly bat an eye before Wilson Picketts version of "Jingle Bells" comes up. There is not a lot one can do with "Jingle Bells" but Pickett makes this his own version for sure. The album wraps up with "Christmas Ain't Christmas, New Years Ain't New Years Without the One You Love" done by The O'Jays. As expected we focus on the harmonies on this track. Lavish backing musicians and the voices blend for the perfect Christmas album closer. FDF Overall Take - Like I said with last years Christmas entry, Christmas music is hit or miss. The good stuff is good..the bad stuff is real bad (Wonderful Christmas..yuk). Anyway, you be the judge of what works for you. Links - If you search you can find the cd on line in new and used versions. It is out of print, but a quick ebay search found them ranging from 4 bucks all the way up to this persons $30+ version. See the links section if you'd like to try to track this down to buy for your collection. Key Players - Paul Simon - vocals/guitar. See the Wiki entry for all the other performers. What caused me to blow off the dust? - This cd is owned by my wife and I was looking for something I haven't listened to in ages, as well as something a little out of the norm for this site. Trying to be diverse and compliment each album where appropriate. 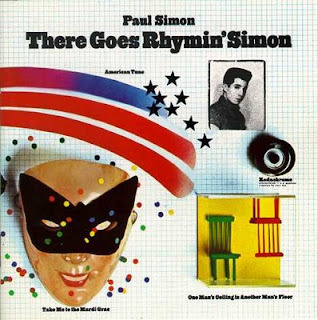 Overview - This was the second solo album from Paul Simon (an earlier one was recorded but not released until 2004). Paul was in fine form on this record recording a breakneck speed and releasing the record quickly. The album would fuse acoustic/folk with R+B and flashes of gospel music. Simon would secure his place as a prominent singer/songwriter with his early solo releases. He'd be busy until the mid 70's then take a few years off before coming back in 1980 with another studio record,. This album would be re-issued in July of 2004 with some demo versions included. Rolling Stone chose this as the 267 Greatest Album of all time in December of 2003. FDF Comments (aka the songs) - (this review is on the 10 tracks from the original record) - The album opens with a "colorful" song to say the least in "Kodachrome". In reading about this, the song was named after the Kodak film of the same name, thus making Kodak require the liner notes to list this as a trademark. It would not be released in the UK as a single because of the trademarked name. Anyhow, the song is an acoustic guitar driven, slightly laid back track. There are some great moments of piano work and the song slowly grows as it progresses. "Tenderness" a pretty song with a really nice horn section that seems to sneak up on you. "Take Me to the Mardi Gras" is a surprisingly mellow song at the outset with a title as such, but it quickly will find you tapping your feet and the closing portion of the Dixeland style music from the Onward Brass Band really strikes a chord. "Something So Right" is a song about his first wife Peggy and Simon really puts his heart out there. He is sort of a wishy washy guy when you look at him but his profession of love oozes from the track. Strong piano work once more opens "One Man's Ceiling Is Another Man's Floor" before the song gets almost a mellow rockabilly feel. Sort of hard to explain in a laid back setting but you'd probably agree. The track "American Tune" is a pretty song which really showcases Paul's voice and its later enhanced with the string section. Another fun uptempo sing along is found in "Was a Sunny Day" has a very similar feel to the album opener. "Learn How to Fall" is an uptempo track with a great organ section. "St. Judy's Comet" comes across as a song, almost a bedtime song, to child about waiting in the night to see a comet. The album closes with "Loves Me Like a Rock" and it closes out the record on a high note. Simon uses the backing singers (Dixie Hummingbirds) that sing along in response to Simon. Where are they now? - Paul is still active both in the studio and live. He is passionate about music education for children, has written for Broadway, acted in film and supported many causes. He has married to singer Edie Brickell since 1992 and has three children with her. His song "Father and Daughter" was nominated for an Academy Award in 2000. His last studio album was called "Surprise" and it was released in 2006. FDF Personal Comments (aka the Live experience) - I have never seen Paul Simon in concert. FDF Overall Take - Coming off the heels of his days with Art Garfunkel he was quick to record and release solo records of radio friendly music. Paul would release many solo records and continue to tour. In 1986 he hit paydirt once more with the release of "Graceland" making his name even more widely known. Paul Simon might not be for everyone, but toss any of his cds on at any time and you are sure to garner a few smiles and not a lot of fuss from guests. The Official Paul Simon site here and on myspace. Tracks taken from "There Goes Rhymin' Simon" which you can buy here. This is the extended version.